Recommended Name: � Franconian pattern. Like the two Tyrol [IPCS #45], [IPCS #46], and the Bavarian [IPCS #54], [IPCS #55] patterns, the Salzburg [IPCS #56], and the Regensburg pattern [IPCS #70], the Franconian pattern is a descendant of the Old Bavarian pattern [IPCS #53]. In 1806 Bavaria became a Kingdom. The realignment of the final territory took until 1815. In addition to the older Bavarian and Palatinate areas of the Electorate, the Franconian domains between Würzburg and Bamberg also became part of the Kingdom. The card maker Georg Martin Neumann from Würzburg, who had been active as an agent for his father-in-law Conrad Wüst in Upper Bavaria for some time, started his own business in 1836. He produced the Nürnberg (Ansbach) pattern (G-5) for the Franconian market, and a modernized Old Bavarian pattern with special characteristics and a reference to Franconia for the Bavarian market: the King of Acorns sits on a throne with the Franconian coat-of-arms. After G. M. Neumann's death in 1869, the single-ended version was replaced by a double-ended one in around 1880. Single-ended packs are known only from c.1840 to 1870. All known tax-stamped copies show the Royal Bavarian tax stamp "U'Franken und Aschaffenburg" in use from 1849 to 1874. The double-ended pattern derived from Neumann's single-ended pattern is still produced today. The throne of the King of Acorns shows the Franconian coat-of-arms. The Ober and Under of Hearts both hold halberds; but they hold them like the baton in the Old Bavarian pattern. The Ober and Under of Acorns are fighting with one weapon only. The pigtail hairstyle of the Obers and Unders of the Old Bavarian pattern has been supplanted by a more modern hairdo. On the Deuce of Leaves a single-headed eagle holds a branch with the suit-sign in his beak, and the imperial orb in his claws. On the Deuce of Acorns the Bavarian-Palatinate lion sets one of his paws on an oval shield displaying an anchor, whilst the other again holds a branch with the suit-sign. The Deuces of Hearts and of Bells are copied from the Old Bavarian pattern without changes. On later examples of the single-ended pattern, the dog is replaced by a swineherd. Characteristic for the single-ended pattern are the small scenes on the pip cards: human failings are caricatured ironically in amusing vignettes. The only exception is the oldest known example, which has pip cards relatively close to those of the Old Bavarian pattern. 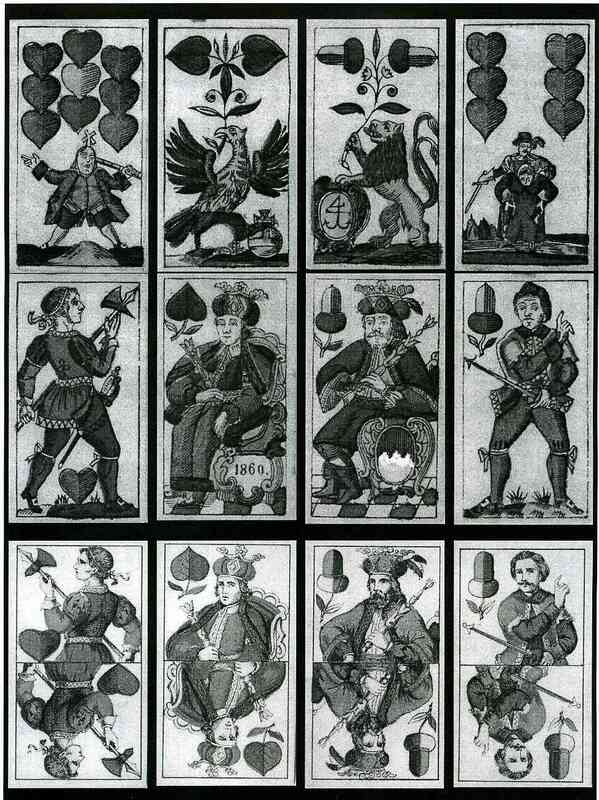 In the double-ended variant the illustrations on the Deuces of Hearts and Bells vanish. Schneider in Altenburg produced a double-ended variant with the lion on the Deuce of Acorns resting on a shield with the Bavarian lozenges. 36 cards: Deuce, King, Ober, Under, 10 to 6. Illustrated pip cards in the single-ended pattern. Manfred Hausler: Das Fränkische Bild, in: Das Blatt Nr. 29, Mai 2004. Manfred Hausler: Augsburger Bild - Altbayerisches Bild, in: Das Blatt Nr. 21, Juli 2000. Manfred Hausler: Das Bayerische Bild, Studien zur Spielkarte Nr. 4, Berlin,1993. Upper two rows: Georg Martin Neumann (? ), Würzburg c.1870; Collection Feindura. Bottom row: Ludwig Neumann, Würzburg c.1880; Collection Hausler. This page is maintained by John McLeod (webmaster@i-p-c-s.org) and Kay Stolzenburg(pattern-sheets@i-p-c-s.org).